Visit 'What Type Are You? ': a micro-site developed by Pentagram, and discover a typeface that reflects your personality. 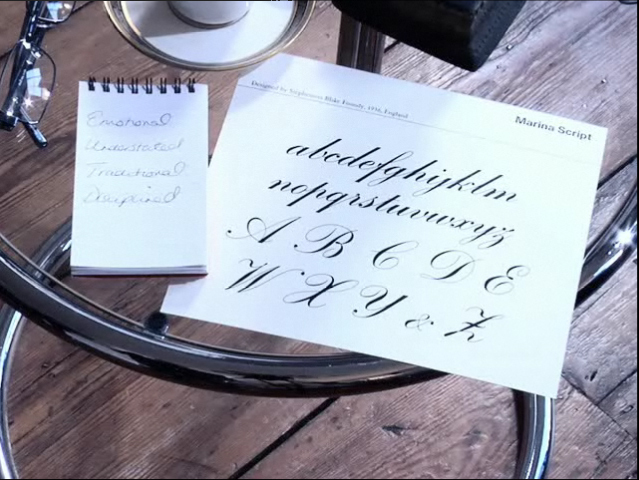 Marina Script: emotional, understated, traditional, disciplined; “a 1936 version of a writing style that is centuries old. It is a typeface with delicately emotional swoops and serifs delivered with an aristocratic precision & restraint... apparently, it’s also my personality summed up in a typeface. Typefaces, and the letters they depict, are a lot like people. They come in all shapes, sizes, weights and forms. Some quietly grace the page while others scream for attention. Some are so wildly popular and well-known that it’s difficult to imagine a world without them while others simply depict the times or a trend. Pentagram, one of the world’s most respected design firms, has created a site that explores the question: What type are you? The site, narrated by a faceless, Freudian faceless analyst, asks you four personality questions, after which you’re presented with a typeface that reflects your personality most accurately according to your answers. You’ll not only learn a little about yourself, but even a little bit of history behind the typeface which represents you. Follow this link to try it for yourself (use the password “Character” to enter the site). This entry was posted in Type Hype and tagged analyst, design, firm, Freudian, Marina Script, Pentagram, personality, questions, type, typeface, typography, what type are you by William. Bookmark the permalink.